The distinction between so-called "intrinsic" and "extrinsic" motivation has been made in psychology several decades ago and the notions have become part of mainstream thinking. Especially as jobs become more demanding in creativity and flexibility of mind, often requiring some determination to overcome unexpected obstacles, it is a commonplace idea that money alone (the proverbial "extrinsic" reward for work) will not motivate people enough to achieve great things. Companies from the smallest startup to large international cooperations are incorporating this knowledge into their staff management to make work more enjoyable and rewarding for their employees. Recently I have been thinking much about my spare-time activities and found that the different kinds of motivation apply here, too. Money is of course less important (unless I am building stuff for myself which I would otherwise have to pay), but that only makes it more evident how huge and diverse the other kinds of motivations are. For example, there is a social motivation which makes many kinds of activities fun as long as I do it with the right people. But more interestingly I found a distinction in the intrinsic motivation which seems to be very important. I actually think that the term "intrinsic motivation" is quite misleading because it suggests that the activity itself is the reward and therefore just doing it will make the doer happy. Since I am using the word "happy" here, let's be conscious that "motivation" and "happiness" are intrinsically linked. Naively, people will be motivated to do things that make them happy either just by doing the thing or by the results it achieves. In practice, of course, there is the introspection illusion and there is miswanting. And that means that we might be motivated to do things which do not actually make us happy. This is why I think that learning more about motivation and choosing ones "wants" and "want to dos" wisely is the basis of a happy and deeply fulfilled life. So, here are the two sides of intrinsic motivation which I found: one is doing the thing itself and it corresponds to what psychologists call "flow". The other is the intrinsic result of the thing itself and it is much harder to grasp. It can be meaning, it can be achievement, it can be doing something good, doing something useful, creating something that lasts. In my own life I just discovered that I was all too often looking for the flow as I knew it from childhood: playing with something or even programming something and forgetting about the rest of the world. In this mode of thinking, anything which interrupts the flow is a sign that what I am doing is maybe not the real thing, it's a sign that diminishes motivation and in the past often left me kind-of helpless, like a child whose favorite toy has been taken away. It was only in the recent months, since I started meditation and while working at Google, that I learned to look for other, less child-like kinds of motivation. Meditation teaches to view distractions as positive challenges: an opportunity to notice the distraction and go back to the object of meditation. Likewise, if I have a higher goal (like programming a script or other program that I actually want to use) I can view a distraction (like some computer error or deficiency in the programming tool set) like just one piece that is part of the puzzle to be solved. Overcoming some pain can actually be a good experience if there is a clear gain. It then becomes a growing pain, that actually makes me stronger. In the case of the lecture preparation, it was my results- or achievement motivation which first let me panic a bit because of the looming deadline and then let me to reserve a block of time to focus specifically on the exercises. Since my intuition didn't come up with anything by itself and so I took a moment to think about how to solve my dilemma. And I had a great idea: use the rational decision process itself to decide what exercise I want to do! And that worked: I got into flow again and felt even better than when doing the slides before. I think that for living a fulfilled live, it is important to align the results one wants to achieve (in the above example: creating world peace and happiness) with skills that one has and enjoys doing (in the example: learning and teaching). Just "going with the flow" is not enough. Definitely isn't for me. But I have still a long way to go to discover my own skills and motivations and how they fit into the world. I learned about the concept of a "Green Smoothie" in Spring 2012 at a time when I was a bit unhappy with my way then current way of eating. Around the same time I went to a Raw Food Exibition and I read the great book "Eat to Live" and one day I almost instantly switched my eating habits. I started cooking differently, ate much less bread and no "spreads" any more. 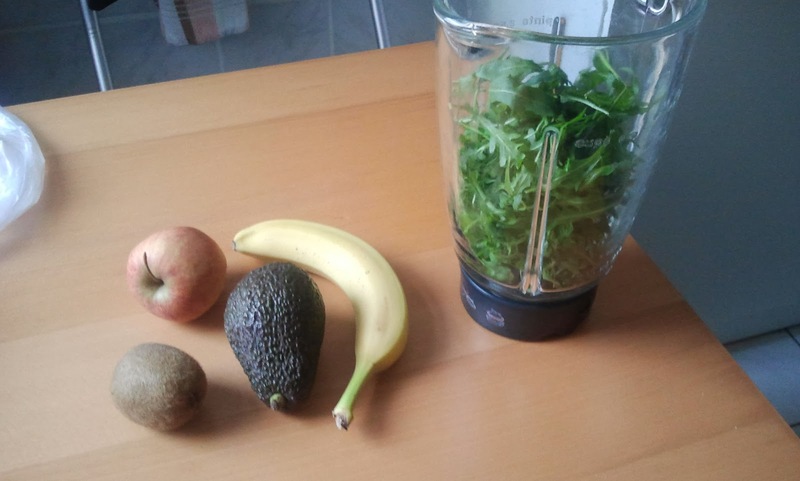 But the biggest change was for breakfast which I made Smoothie-fest every day! Of course, banana, kiwi, and avocado are peeled before blending and I take the core out of the apple, but leave the skin on. Then I add about a cup of warm water and blend. And that's my healthy, tasty breakfast. I eat some variation of this almost every day with an exception maybe once a week. The most common variation is in the salad: today (as seen in the picture) I had rucola/arugula. Other favorites are various kinds of lettuce, spinach, or, rarely, field salad. Instead of an apple, I also often use a pear. If I don't have an avocado (or all my avocados are still to hard), I'll replace the water with some soy milk, so I have at least one source of fat in the drink. I'd also use linseed for this if I remembered where I could buy it already crushed. A great breakfast makes a good start into the day and with already five small servings of raw fruit and leaves covered, I am primed for a healthy cooked lunch.